I was born in Halong and now live in this city, I would like to share some information about eating when you travel Halong bay. - Eating on the shore: You can take a taxi to Cai Dam area where there are many snail restaurant, I usually eat at Kim Quy or Ngoc Suong 2, cost about 300.000 (14 usd) vnd each, more expensive choices are Golden Crab or Thien Anh restaurants, no less than 500.000 vnd (25 usd) per person. - Eating on the sea: Take your time for a trip to Cot 5 area, it cost maximum 7 usd for a taxi from Bai Chay, Mai Linh taxi is recommended. My favourite place here is Hong Quang or Hong Dam fish farms, very fresh seafood from the sea, it is very interesting if you go in summer, it cost about 15 usd/person including some beers and fizzy drinks, generally it cannot be less than 10 usd/person. In addition you can go to Hai Sam farm in Cai Dam area however this place is not as good as in Cot 5, sometimes I come here if not wanting to go too far. About 12-15 usd/person is plentiful. Perhaps this is the most expensive dish in Halong, actually you can find it only in Quan Lan island in Bai Tu Long bay, Sa Sung is a type of earth worm living in the sand at beaches, they tend to live in clean environment with oxygen, in the polluted area Sa Sung is never found. People in Halong use Sa Sung to make different dishes. However price is not cheap at all, 1 kg of dry Sa Sung is worth 100 - 300 usd depending on quality. You have been familiar with crabs, sentinels, prawns how about Tu Hai? It is a kind of rare seafood with high value of nutrition and is naturally not cheap. Tu Hai can be found only along the shore of Bai Tu Long bay in Van Don district, Quang Ninh province. 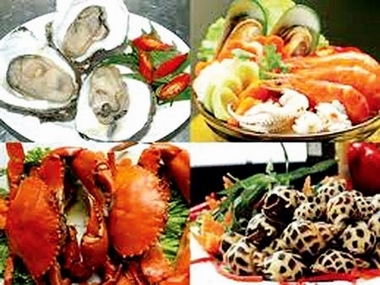 In addition, there are many other appealing dishes in Halong await you. For the seafood lovers can find in Halong many delicious dishes, prices are very affordable at only about 3 usd to 8 usd depending on the type of dish you have. At night, you can also eat at the night market in the Thanh Nien night market or food street Gieng Don. Food quarter is the most visited place in Halong city. You can also go to cafes like Emeraude on Halong road, many international visitors come for cozy and elegant atmostphere or Wifi Laptop Cafe in the centre of Halong city.